I am LOVING Growing Up Hip Hop! Picking up from last week, Angela chases after Kristinia, who walked away from their discussion about her cancellation at Angela's showcase. Kristinia explains the entire situation about her father, and breaks down in tears, apologizing. Angela didn't know, but insists she'll be there for her through this. They make up, and promise to have a good time at the Jazz in the Gardens Music Festival later. Later, at the music festival, Angela goes to see TJ behind the scenes. 80,000 people have come out, and, of course, TJ is nervous. As Run-DMC performs, they pay tribute to Jam Master Jay, and bring out TJ to spin a little bit. When TJ gets on the ones and twos, he feels like he has an out-of-body experience, sharing this moment with his father up above. He kills it, and everyone congratulates him. TJ definitely made his dad proud! Everyone was really moved, especially Kristinia. So inspired, in fact, that, as soon as she gets back to LA, she decides to really focus on finding her dad and rebuilding their relationship. Later, Boogie is in LA to support his father, who's going to court for yet another custody battle. Damon has, unfortunately, been through this before with Boogie's mom. Probably due to child support, Damon has a warrant for his arrest in New York, and he went down to North Carolina for a while to make some money making movies for bail.The father and son have a conversation about people using their kids as pawns to get back at their exes. It's sad to hear about it, but there's three sides to every story--his, the mother's, and the truth somewhere in between. If this lady is using her child to get back at Damon, that's terrible. Hope something is worked out. Meanwhile, back in New York, Angela gets a message from her stalker on Instagram asking her to marry him! He states boldly that he "won't give up," which is very creepy! In LA, Kristinia goes to talk to her uncle El, determined to find her father. She thinks he may have information that he's not telling her. Kristinia doesn't want to go throughout her life thinking that she could have a better relationship with her father, which is understandable. El asks her to promise him to not go looking for James by herself, but she admits she has already. He tells her to stop, but she kind of thinks he knows where he is. El admits that he does, but he doesn't know how James would react if they just show up to see him. However, this is Kristinia's dad, and she wants to get him the help that he needs. It's definitely a tough situation to figure out the best move here. In Bulgaria, Romeo wraps up his movie, and has a drink with his co-stars. They talk about relationships, and Romeo reveals that he and Toneata are in this honeymoon phase, which, as his co-stars point out, will fade out. The conversation makes him wonder if his relationship is serious, AND about Angela. OOH! Angela later gets a visit from the NYPD again, and tells them about her stalker on social media. He has a whole Instagram page completely dedicated to her! The cops state that she needs to reach out to him personally and tell him to stop. If he doesn't stop after that, she needs to get an order of protection. Angela decides to move in with Kanayo, and FaceTimes Romeo to talk about the situation. The cops have basically told her that they can't do anything unless this guy commits aggravated assault. Romeo asks her (seemingly as a half-joke) to move to LA with him. Apparently, he's "figuring things out" with Toneata, and wants to see Angela when he gets back to LA in a few days! Angela does indeed go out to LA, and goes to pay her sister Vanessa a visit. At first, Vanessa calls Angela dramatic when she talks about her stalker, but after Vanessa sees how serious this is, she tells Angela to follow the cops' directions and DM the guy to tell him to stop. Angela doesn't want to do that all of that, feeling like it will open the door of communication in this weirdo's mind. Angela walks out, leaving to go see Romeo. Kristinia and Boogie also come over to get a workout in. Of course, Angela and Romeo continue to flirt! He even tells her that they need to talk in private about some things, and I'm trying to figure out what that is! Later, Romeo works on his clothing line, Rome Everything, inviting Egypt to be one of the models. Egypt does well, but then her mother pops up out of nowhere! Pep, what are you doing there?! Of course, Pepa starts giving directions to Egypt and Romeo decides to end the photoshoot shortly after, having gotten the shots he needed anyway. Egypt again has to have a talk with her her mother, and Pepa states, yet again, that she's been in this industry for a long time and it's rough. Yes, Pepa needs to prep and protect her, but she also needs to give the girl a little bit of space to do her thing! Watch over her, yes. Hound her at every photo shoot and recording session, no! At Angela's spot in LA, she plans to hang out with Romeo, though it's unclear if they are having a date. She's even stressing about what to wear! She talks with Johanna and Vanessa, admitting that she doesn't know what's going on between the two of them. There's clear as day chemistry between them, but they're faking! Vanessa warns her to be careful because he does still have a girlfriend. After Vanessa brings up the stalker again, though, Angela storms off. She really does need to let this guy know that she needs him to stop bothering her! Later, Angela goes to meet Romeo at the beach, and they sit and talk. Romeo asks about her relationship status, and Angela states that she's single. Romeo admits that he and Toneata broke up, and he claims it's because he's really focused on No Limit. It's clearly because he didn't want to be with the girl. Romeo plans to live life and celebrate, and Angela secretly wonders if they should test the waters together! Romeo even goes as far as to ask her who is the one who may have gotten away in her life, definitely thinking it might be him! That night, Angela goes to meet with her uncle, Russell Simmons. He asks her about her love life, and she admits she went on a date with Romeo (he gets a laugh out of that!). However, she really wants to talk about getting her Foofi line funded. Russell gives her good advice, telling her that it's definitely not going to be easy, but she has to keep working at it. You can never fail until you quit. Russell also bring up Angela's stalker, which Vanessa told him about. He stresses that Angela needs to message the stalker just like the cop said. Hopefully she listens! 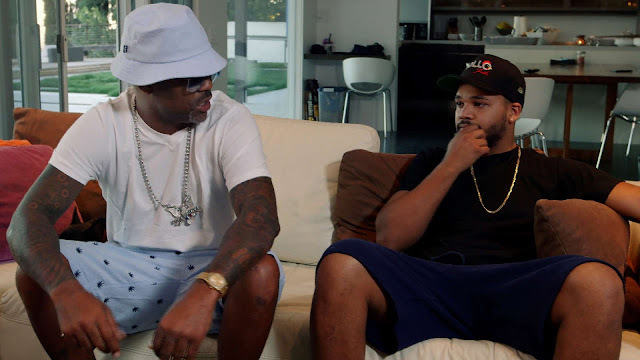 At the end of the episode, Romeo goes to talk to Master P, not looking forward to the conversation. Master P is happy and proud of him, but wants to know where Romeo's at with the music. He tells his son that he has to way more to keep this empire going. It's a lot of pressure, but Romeo needs to do it. Be sure to watch all new episodes of Growing Up Hip Hop at 10 p.m only on WE tv! The 2016 Oscar Nominees are Revealed!